Tattoos are a form of self-expression and more and more people these days are getting inked! They are a means of drawing attention to your beliefs. Also, tattoos are a powerful means of self-motivation as they are a part of your physical body. The choice of tattoo is purely personal. Some people prefer text-based tattoos while some like to get animal figurines or religious symbols inked on their body. One symbol that is very often preferred by people is that of “Om”. Om is one symbol that signifies spirituality and knowledge. Let’s be real, a tattoo is something that fascinates each of us at some level. Though, many of us opt out of it to avoid all the pain and sometimes because our job profiles do not allow it. However, you are really into it then you must go through the following Things to know before getting inked. What all to consider before getting inked? Get your tattoo done from a reputed salon and reputed artist to reduce your chances of post procedure discomfort. Do not go for a cheap roadside artist for tattoos. Avoid taking painkillers like aspirin which act as blood thinners otherwise, you will end up bleeding more when you get your tattoo done making it difficult for the artist as well as yourself. Do ample research beforehand to ensure that the equipment used is sterilized. The design and the site on your body where you want to get inked is totally up to you. The price depends on the standard of the salon, the brand value of the artist, the level of hygiene and of course on the size and intricacy of your chosen design. Dress up in dark clothes so that if any blood spatter gets on your clothes it is not too obvious and unsightly. Take a day off from work on the day you schedule your appointment because you definitely do not want to rush things and make the artist too panicky. For a number of hours after you get your tattoo done, the tattoo artist might ask you to protect your tattoo by wrapping a cling film around it so that, the risk of your skin getting contaminated from the environment is reduced. In case, you observe redness post tattoo and your skin feels tender, you might be advised application of ice packs and consumption of analgesics to dampen the inflammation. After the tattoo is done, some sort of emollient ointment that has vitamin E and antibiotics will be handed over to you by your tattoo artist. Application of petroleum jellies is not advised since they can cause the pigments to leach out leading to fading away of tattoo. Also, petroleum jellies might clog pores leading to breakouts. In case you have extreme pain, redness or purulent discharge from the area you got your tattoo done, visit your doctor, at the earliest. 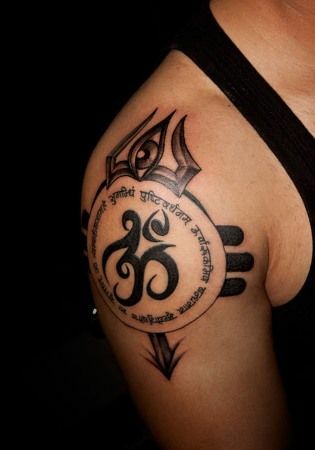 Now, here is a compilation of best OM tattoos you can flaunt! 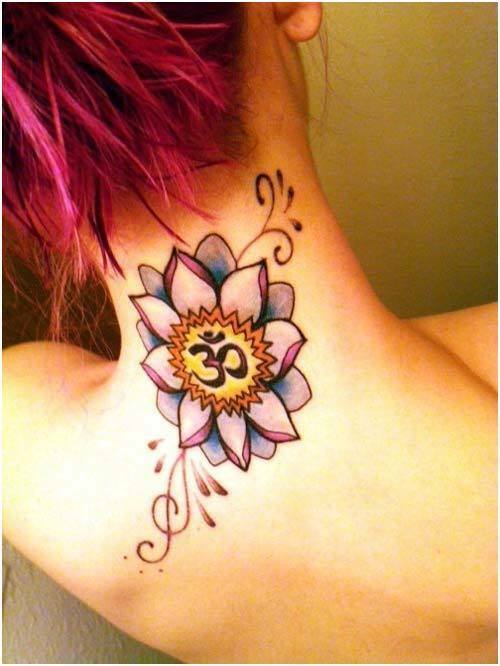 Om tattoo inked on the nape of the neck looks unique and stylish. You can flaunt this tattoo if you have short hair or like to tie your hair up in a bun. The design of this “Om” is inspired by a pretty, full-bloom Lotus flower. The “Om” sign is surrounded by delicate petals in shades of Pink and Blue. The “Om” itself is done in a fiery shade of vibrant orange center of the flower. Orange invokes the feelings of spirituality and purity. This one sure is a eye-catchy one! This one is simple, elegant and evergreen tattoo design with symbolic om inked onto the bicep. The tattoo artist made use of beautiful shades of Blue to fill in the outlines. 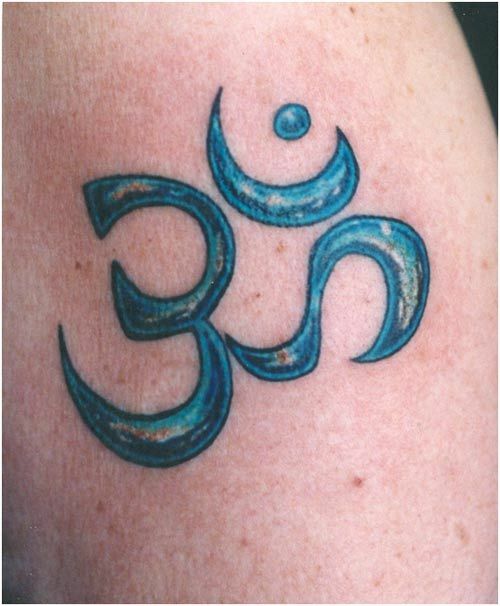 This OM tattoo has been styles with a bold, dark blue line as the outline. 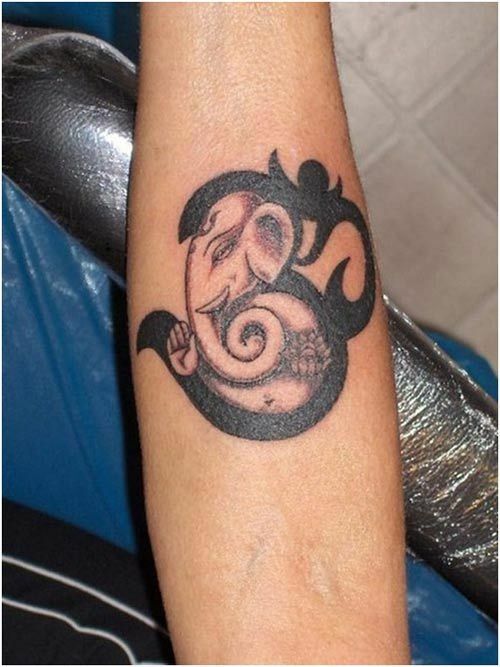 Om tattoos are very often amalgamated with sketches of Lord Ganesha and the outcome is almost always lovely. In this one, Lord Ganesha beautifully holds a delicate lotus flower in his sturdy trunk. The tattoo is predominantly done in bold shade of Black. The curvatures of the Ganesha sketch and om symbol flow into each other quite naturally and beautifully. Mandala rangolis and paintings are very much in vogue these days. 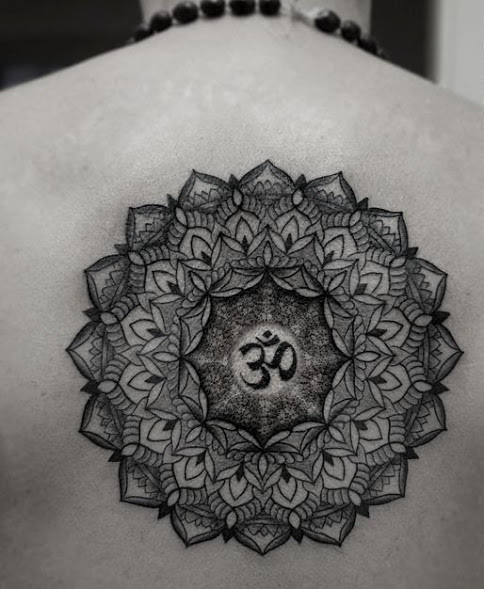 This tattoo looks stunning with a small Om symbol embedded beautifully into the heart of the Mandala flower. The guy flaunting this tattoo chose to get it done on his upper back, a good choice! 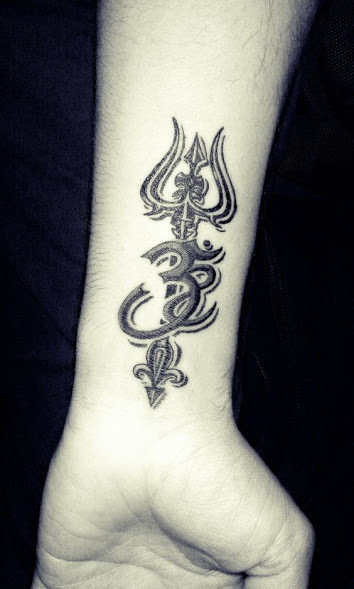 Shiva’s trishul and the symbol of “Om” can be paired up together for a stunning looking tattoo on the forearm. Charcoal Black is the best colour of choice for this tattoo to define the sketch beautifully. 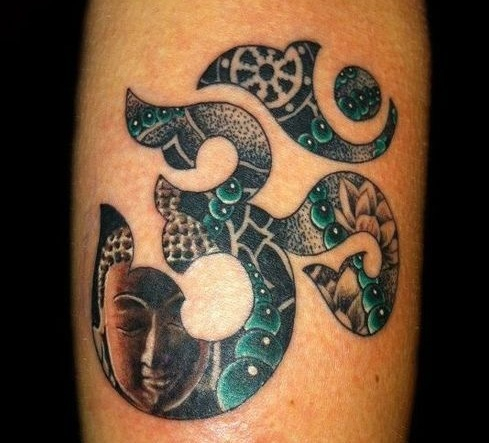 Experienced tattoo artists can add special details to a small Om tattoo in order to give it a 3D effect and appeal. This effect is achieved with help of shaded lines and highlights that give the tattoo an illusion of depth. The sides are chosen to be pointed to give it a sword like feel as well. 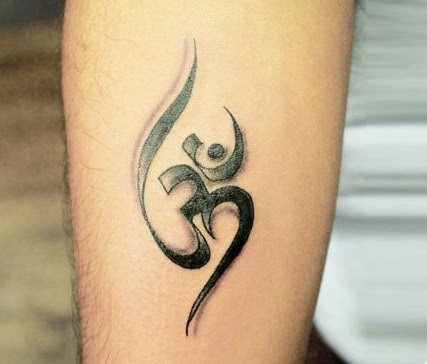 For those who want to go for a minimalist Om tattoo can go for this one, surely. If you are getting a tattoo done for spiritual reasons or to remind yourself constantly for staying positive and calm, go for a tattoo that combines the face of meditating Buddha with Om symbol. Of course, you need to be into chanting and meditation for it to work. However, a tattoo surely serves as a positive reinforcement. This tattoo design is very simple, sober yet quite appealing. 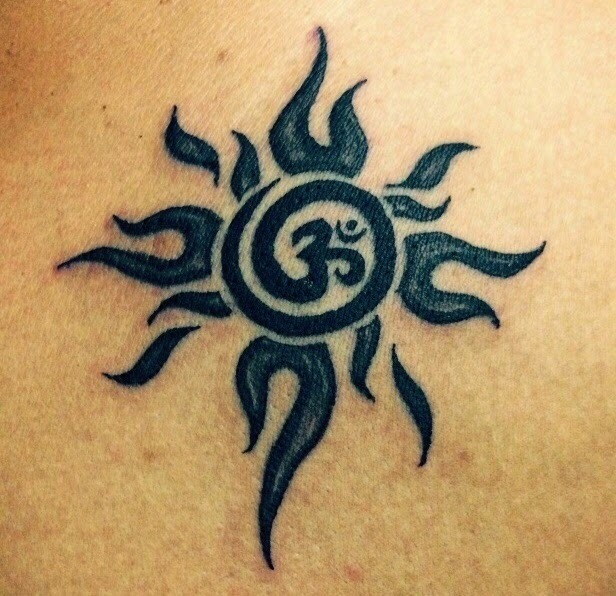 The sun surrounding the symbol Om renders a spiritual yet modern twist to the tattoo. This one is particularly suited for males at it represents the Fire element of Sun and Shiva. All Hindus are aware of the Mahamrityunjaya mantra and the power associated with it. In this one, beautifully calligraphy of Om symbol is surrounded by the wordings of Mrityunjaya mantra. Other accessories like Shiva’s Tilak and Trishul add extra appeal to face. A simple combination of Swastik and Om looks cute. You can get this done on forearm or wrist or even the back of your fist. So, these were some of the best OM tattoo designs that you can get as per us. Hope you like them!